The lawsuit challenged leases issued in Wyoming, Utah and Colorado in 2015 and 2016, during President Barack Obama's administration. BILLINGS, Mont. — A judge blocked oil and gas drilling across almost 500 square miles in Wyoming and said the U.S. government must consider climate change impacts more broadly as it leases huge swaths of public land for energy exploration. The order marks the latest in a string of court rulings over the past decade — including one last month in Montana — that have faulted the U.S. for inadequate consideration of greenhouse gas emissions when approving oil, gas and coal projects on federal land. U.S. District Judge Rudolph Contreras in Washington appeared to go a step further than other judges in his order issued late Tuesday. Previous rulings focused on individual lease sales or permits. But Contreras said that when the U.S. Bureau of Land Management auctions public lands for oil and gas leasing, officials must consider emissions from past, present and foreseeable future oil and gas leases nationwide. "Given the national, cumulative nature of climate change, considering each individual drilling project in a vacuum deprives the agency and the public of the context necessary to evaluate oil and gas drilling on federal land," Contreras wrote. The ruling coincides with an aggressive push by President Donald Trump's administration to open more public lands to energy development. It came in a lawsuit that challenged leases issued in Wyoming, Utah and Colorado in 2015 and 2016, during President Barack Obama's administration. Only the leases in Wyoming were immediately addressed in Contreras' ruling. It blocks federal officials from issuing drilling permits until they conduct a new environmental review looking more closely at greenhouse gas emissions. The case was brought by two advocacy groups, WildEarth Guardians and Physicians for Social Responsibility. WildEarth Guardians climate program director Jeremy Nichols predicted the ruling would have much bigger implications than a halt to drilling in some areas of Wyoming, assuming the government does what Contreras has asked. "This is the Holy Grail ruling we've been after, especially with oil and gas," Nichols said. "It calls into question the legality of oil and gas leasing that's happening everywhere." Wyoming Gov. Mark Gordon criticized the ruling, saying carbon emissions shouldn't be reduced at the expense of workers who provide reliable and affordable energy. "Bringing our country to its knees is not the way to thwart climate change. We need solutions not grandstanding," said Gordon, a Republican. Federal officials were reviewing the court ruling to determine its implications and had no further comment, BLM spokeswoman Kristen Lenhardt said. Emissions from extracting and burning fossil fuels from federal land generates the equivalent of 1.4 billion tons annually of the greenhouse gas carbon dioxide, according to a November report from the U.S. Geological Survey . That's equivalent to almost one-quarter of total U.S. carbon dioxide emissions. Companies paid more than $6.5 billion to produce oil, gas and coal from federal lands and waters in 2017, according to the most recent government figures. The money is split between the federal government and states where the extraction occurs. Kathleen Sgamma with the Western Energy Alliance, which lobbies on behalf of the oil industry, said the BLM already was analyzing emissions appropriately under rules set up during the Obama administration. Following previous court rulings over climate change, the BLM has gone back and reconsidered the effects of fossil fuels and then re-affirmed its approvals of projects. 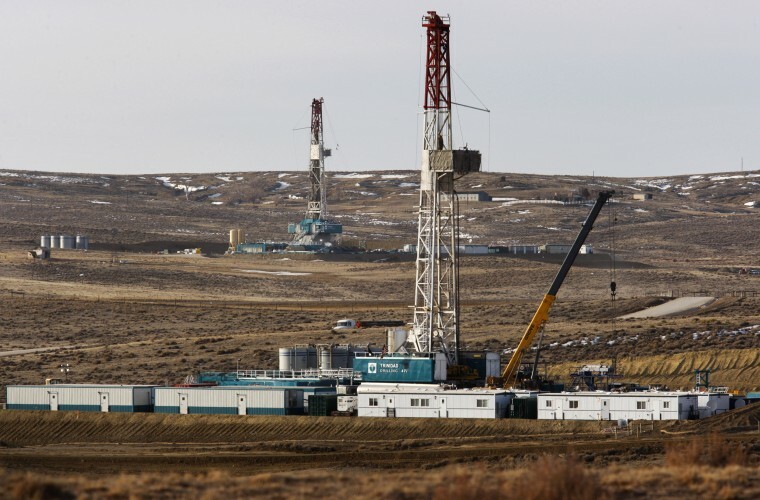 That could happen again in this case, with further studies done before drilling is allowed to proceed, said Harry Weiss, an environmental lawyer based in Philadelphia whose clients have included oil and gas companies. "This decision should not be interpreted as a ban on leasing activities," Weiss said. "The court is not ruling on whether it's thumbs up or thumbs down. The court is simply grading how the administration did analyzing the issues."